This article appeared in the October 2007 edition of the African Sporting Gazette. The country of Namibia is a celebration of all that is wonderful about the magnificent continent of Africa! Namibia was named Deutches Südwestafrika during the German colonial rule and then South West Africa during the British and South African eras. 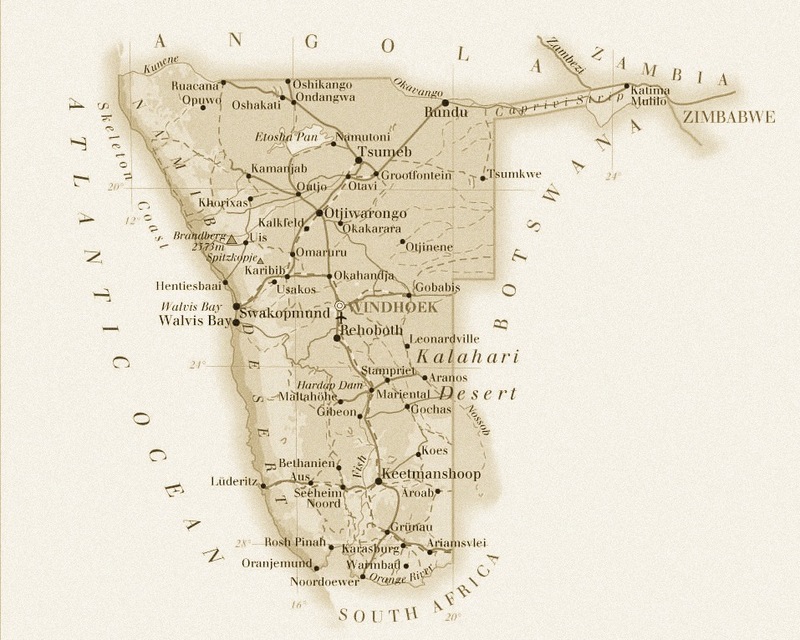 Those who opposed colonial rule preferred the word €˜Namibia,’ from a Nama/Damara word meaning “shield” used for the coastal desert, the Namib, which long protected the interior from access by sea. As a people we are proud of our young national identity – we have been an independent and free nation for 17 years, and take our fledgling democracy seriously. About 1.8 million people share the vast spaces of Namibia – one of the lowest population densities in the world with 1.5 people per square kilometre. Our population can be divided into (at least) 11 ethnic groups. Although our official language is English, Namibians speak nine different tongues, including some of the Khoisan languages which include the ‘clicks’ that present an enigma to most native English-speakers. Each one of the country’s cultural groups has its own rich heritage and traditions. However, due to the unfortunate Apartheid history of Namibia (during SA rule), the division of people into cultural or tribal groups became an extremely sensitive issue, and we prefer to think of ourselves as Namibians – our hearts and souls are Namibian, and that is what truly matters. Almost 365 days of sunshine, endless blue skies and so much more .. This vast and pristine land is a haven for wildlife, nature, and cultures that are the embodiment of Africa, and yet unique in many ways. From the red undulating dunes of the Kalahari in the southeast to the desert-adapted elephants and black rhino of the northwest, from the shifting sand dunes of the Namib and the desolate and lonely coastline, to the celebration of life that is Etosha, and from the ancient San to the colourful Herero and their nomadic cousins, the Himba, Namibia is surely one of the most fascinating countries on earth. Namibia boasts remarkable natural attractions such as the Namib Desert, Skeleton Coast, Fish River Canyon, Kalahari Desert, Etosha National Park and Caprivi Strip. Namibia’s capital city, Windhoek, as well as the coastal town of Swakopmund are highly recommended destinations during your Namibian adventure. 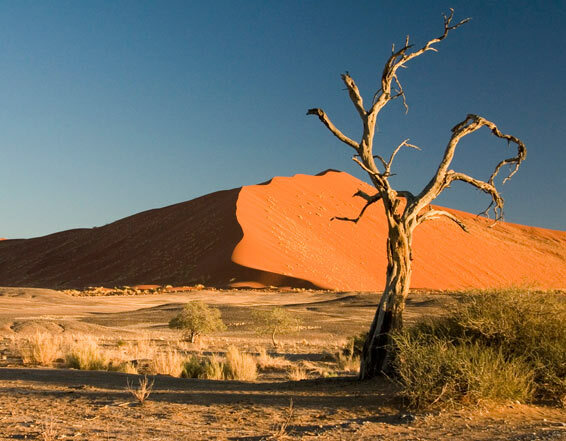 Known as the world’s oldest desert , the Namib stretches almost 2000km along the coast of Namibia, from the Orange River on the southern border with South Africa up north beyond the Kunene River into Angola, to form one of the most spectacular and richest deserts in the world. Gently sloping toward the Atlantic Ocean, it is patterned by a sea of giant red sand dunes, some which reach 1000 feet (305 m) high. It is an inhospitable region characterized by searing heat during the day and bitter cold at night. The annual rainfall is limited to only .2 to 3 inches (5 to 76 mm) per year. For the most part it is dry with life being nurtured to a large extent by wind-borne nutrients from the interior and moisture from the rolling fog which forms when dry heat rising from the desert sands meets with the cold air from the South Atlantic’s Benguela Current which often blankets the dunes to create enough moisture for many specially adapted species of fauna and flora to survive. One of the most notable of these is the Welwitschia plant, which is considered to be the longest-living member of the plant kingdom, with individual plants estimated to be upwards of 2,500 years old. The Namib is also home to a variety of lizards, geckos, beetles, rodents and mammals. The Skeleton Coast – an evocative name for Namibia’s hostile northern seaboard – a graveyard for unwary ships whose surviving sailors over the centuries came ashore to die in the harsh wastes of the Namib Desert. Along the shore of the Skeleton Coast, brown hyena and black-backed jackal have been seen foraging on fish and larger carcasses. Birds include the dune lark, Gray’s lark, and threatened lappet faced vulture. Among strips of low-lying shrubs, €˜pencil bush plants’ and €˜dollar plants’ trap sand between the dunes and the shore. The Cape Cross seal colony, where the first European, Portuguese explorer Diego Cao landed on Namibian soil in 1486, and where he erected a stone cross in honour of King Johannes of Portugal, is worth a visit. Do be warned, however, that this is probably the smelliest place on earth!! The breathtaking Fish River Canyon, situated in southern Namibia, is the second largest canyon in the world after the USA’s Grand Canyon. This area is noted for its remarkable geological features with rock strata of greys, purples and pinks formed over hundreds of millions of years. Remnants of the great Fish River appear as pools at the base of the canyon after the rains. Vegetation is almost entirely dwarf shrub savannah, consisting mostly of thorn trees. Zebra, springbok and steenbok are sometimes spotted. This is one of Namibia’s most famous hiking trails. The Ai-Ais Hot Springs, situated at the southern end of the canyon, is located at sulfurous, hot springs, and means ‘burning water’ in the local dialect. This resort is most certainly worth a visit. The immense Kalahari Desert spans South Africa, Botswana and Namibia. Although it is referred to as a desert, the landscape is surprisingly well-vegetated and in springtime the undulating, red sandy plains are covered in carpets of flowers and green grass. It is a region of great beauty and infinite vastness. Lush, artesian springs around these villages of Gochas and Aranos attract a rich and varied bird life. The Kalahari is home to some of the best springbuck and gemsbuck trophies in the world. Etosha National Park is one of Southern Africa’s largest and finest game parks, and covers an area of 22 270 square km. Etosha, meaning “Great White Place€ is home to 114 mammal species, 340 bird species, 110 reptile species and 16 amphibian species. The Etosha Pan covers around 25% of the National Park, and was originally a lake fed by the Kunene River, but dried up when the river changed course thousands of years ago. The pan now is a large dusty depression of salt and clay which fills only if the rains are heavy. This temporary water in the Etosha Pan attracts thousands of wading birds including impressive flocks of flamingos. The perennial springs along the edges of the Etosha Pan draw large concentrations of wildlife and birds. The game viewing in Etosha National Park is excellent, the best time being from May to September – the cool and dry months in Namibia. Game includes elephant, black rhino, lion, cheetah, leopard, black faced impala, kudu, zebra, springbuck, zebra, and giraffe – to mention but a few. Etosha offers 3 camps – Okaukuejo, Halali and Numutoni – all run by Namibia Wildlife Resorts, and which have recently undergone major renovations and upgrades to bring the accommodation and facilities on par with, and dare one say even €˜outdo,’ any of the famous game reserves in Africa. Do visit the Namibia Wildlife Resort’s website: www.nwr.com.na for more information as well as bookings at Etosha and other national parks in Namibia. The Caprivi Strip is a long panhandle enclosed by the permanent waters of the Kwando, Linyanti, Chobe and Zambezi rivers. The Caprivi stretches eastwards ending at the border junction of Namibia, Botswana, Zimbabwe and Zambia. This area offers an ecologically diverse combination of grassland, woodland, floodplain, riverine forests and reed beds supporting over 60 mammal and nearly 350 bird species. Our capital, Windhoek, lies in the heart of the central highlands and is surrounded by mountains. This is one of the safest, cleanest and best organized capital cities in Africa, and the ideal place to begin or end your Namibian safari. Windhoek is a truly cosmopolitan city, which offers a variety of excellent dining options (try Joe’s Beerhouse and Gathemanns Restaurant) as well as great shopping for locally manufactured crafts, jewelry (ours truly are €˜peace and prosperity’ diamonds), leather, locally embroidered linen and so much more. Windhoek has a combination of innovative modern and old German colonial architecture. In the centre of town is a charming pedestrian walkway with shops and open-air market stalls. The pavement cafes in this area are ideal for €˜people watching’ and there is such a diversity of well dressed, beautiful people that you can sit there all day and watch in fascination. Cultural tours in Windhoek are popular – tours to Katutura introduce the visitors to the vast diversity of cultures living together in harmony, and provide them with a glimpse of the lifestyle from the various ethnic groups, homesteads, markets, different projects (recycling, women’s projects), local cuca shops and shebeens, schools and kindergartens. Swakopmund, our country’s second biggest town and Namibian’s most popular holiday destination, is a charming seaside resort nestled in the mist on the Atlantic shore between the dunes of the Namib Desert and the intriguing Skeleton Coast, and is the ideal location from which to explore these fascinating areas. This quaint town is a showcase for some of Namibia’s finest and most elaborate Germanic architecture, and exudes romance and history. Swakopmund has many small galleries, book stores, manufacturing jewelry stores, dealers in African art as well as an exceptional craft market under the palm trees near the beach. Excellent dining options include the traditional German €˜Brauhaus’, €˜The Tug’ Restaurant on the beach overlooking the historical jetty, as well as the very elegant Hansa Hotel. No visit to Swakopmund is complete without traditional German coffee and cake at either CafÃ© Anton or CafÃ© Treff. 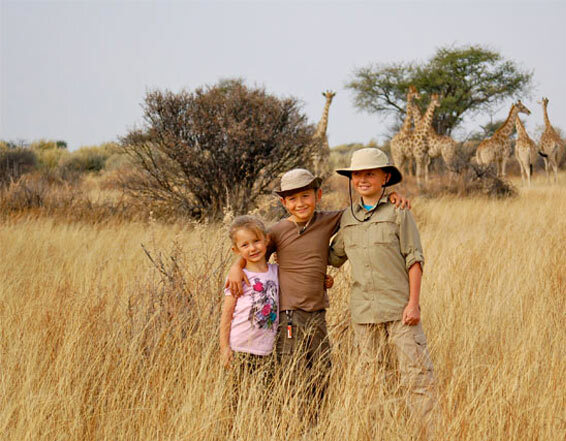 A variety of accommodation options are offered throughout Namibia, from international standard hotels, guest farms, backpackers accommodation, bed & breakfast or self-catering options to lodges and quaint country hotels. I recommend that you visit the website of the Hospitality Association of Namibia www.hannamibia.com for more details. Most Namibian Hunting Professionals will gladly put together a personalized tour of our beautiful country for you to enjoy before or after your hunt, or recommend a local tour operator to do so. Our country’s national airline, Air Namibia, operates daily flights between Windhoek and Europe, namely four times to and from Frankfurt in Germany and three flights to and from London Gatwick in the United Kingdom. These services are operated with two MD11 aircraft. Air Namibia also operates two daily flights between Windhoek and Johannesburg as well as Cape Town in South Africa, using a Boeing 737. Most nationalities, specifically citizens of the USA, most EU and all Commonwealth countries, do not require visas to visit Namibia as tourists. Namibia is a country like no other – we look forward to welcoming you to our beautiful shores – soon!